Just devoured the end of my @itstodie4 loaf. Damn. What the hell am I supposed to do now? I finally tried @erin_ireland‘s world famous banana bread, available all over Vancouver. The verdict? It’s famous for a reason. YUM! 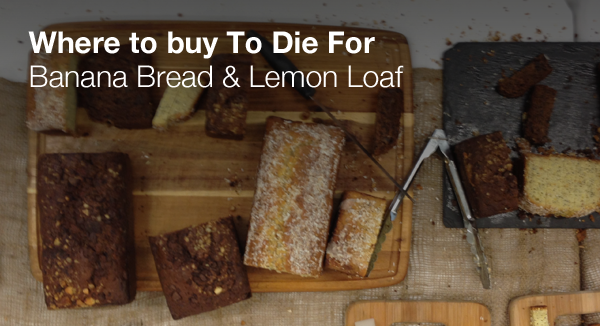 “The To die For Banana Bread is actually all it’s hyped up to be. It’s got macadamia nuts and chocolate!” – Mary S.
@ShannonBosa: @erin_ireland I fear that’s what will happen with your banana bread. I plan to wear my fat pants on our next meeting. @ShannonBosa: Enjoying a night in with my kids, dogs, Wii and @erin_ireland‘s banana bread. Heaven! Andrew Ronald: I would love to get some more banana bread from you. I would like to pay for it this time! What will it cost me? @epsimoulis Officially your banana bread is the best! @eventenvybc @erin_ireland your banana bread looks incredible! Leighann Boquist Bold: The banana bread is out of this world amazing. Seriously, amazing! No one else at Oliver & Lilly’s stood a chance of having a bite, I sat nicely and quietly enjoying every single gobble. Chris Irving, Executive Chef of Pourhouse: It is delicious! I don’t just like it, I LOVE IT!!!! A very BIG thank you for the amazing gift!!! …her city-wide famous, fresh baked banana bread I have heard so much about, and a sweet Christmas card! Totally made my day Erin! Nicole Dennis Durnin: @erin_ireland Still wondering when I will get a little taste of this famous Banana Bread. Nicole Dennis Durnin: @erin_ireland Thank you so much for the AMAZING Banana Bread. I now know what everyone was talking about. 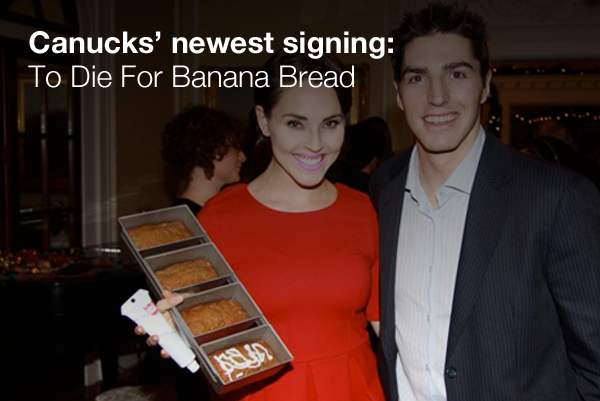 @VanCityBuzz @designerjillian yeah I’ve been craving @erin_ireland‘s banana bread ever since i got a little taste! 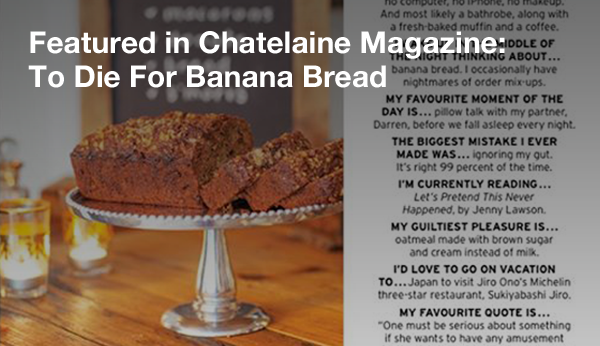 @VancityBuzz: Oh yes @Cwistal u must try @Erin_Ireland‘s famous banana bread. It’s the best!! @VancityBuzz: To die for! Best banana bread ever! @BrandanPrice: #FF @erin_ireland For her super fresh Banana Bread, I’ve heard amazing things! @DavidSojka: my twit feed is all @erin_ireland‘s banana bread and #fatindiebands. @JonathanBallot: @erin_ireland pweeese tweet me your biggest piece of Banana Bread! @kt_belle: Inspired by @erin_ireland, I plan to make Banana Bread this weekend. YUM! @danudey: @erin_ireland After weeks of hearing about this banana bread and not experiencing it first hand, I have to know – how do I get in on this? @greenchairevents @erin_ireland @designerjillian – Best of luck tonight ladies! Erin’s banana bread is to die for and well worth dropping off a toy! Looking forward to picking up my banana bread from @Erin_irelandlater this week. Not saying where or when, as I don’t want to get robbed. VANCOUVER: The beautiful @erin_ireland is waiting in the cold for you to pick up the BEST BANANA BREAD ever. Get out of bed already. @ac_awesome: You guys are killing me. RT @jeremylim: Have you ever tried @erin_ireland‘s banana bread? It’s great. @ac_awesome: This banana bread is like a mythical pot of gold that everyone’s had but me! Please FedEx, Erin! @FarhanMohamed: everyone’s always raving about your banana bread, how do i get some? @Christie_Lohr: I’m starving and @erin_ireland‘s famous and Vancouver’s best banana bread would really hit the spot right now. @JeremySzafron: I snuck a bite of @erin_ireland banana bread last night, gotta give it to ya- to die for. Let’s get it in a store! @JanGalvez: I had a couple slices of @erin_ireland‘s #bananabread. It’s sooo good I can’t put it to words yet! http://yfrog.com/fxfg7dj I’ll be able to put together some feedback when i get control of my senses. It’s too good! Jan Galvez: The banana bread is soo good! The chocolate and macadamia nuts top if off very nicely – heavenly. I left it overnight too and I was hoping for it to firm up but it stayed very moist like you said. I’m trying to restrain myself from eating all of it in a couple sittings. Even though I had high expectations, it still exceeded them. Thank you for the amazing bread! @CamilleWho: @erin_ireland‘s banana bread it all over my twitter-feed! Gotta get me some of that! @cwistal: When your banana bread enterprise gets big – please consider a delivery option. @BreatheCouture: I’m having a serious craving for @erin_ireland‘s banana loaf or one of her banana chocolate chip muffins! @JacintaGavinio: Oh I could’ve used your banana bread this weekend. I want it fresh outta the oven! @JeremyLim: @erin_ireland Hey – when does the banana bread go to market? I’m craving some right now. That and a tall glass of milk. maryinvancity: Heading down to #downtownsweaters meetup. And folks, I have some of @erin_ireland famous banana bread to share! conner_g Just tried @erin_ireland ‘s famous banana bread courtesy of @maryinvancity at #downtownsweaters Amazing! @erin_gee: @erin_ireland okokok. you are the banana bread queen. @MissCherylTan: You should totally start charging people for your b-bread! Everyone raves about it. I do too! @Finnspace: all this talk of your banana bread is intriguing – I have always prided myself on mine – maybe a banana bread off?? BC Chapter of AMA: We didn’t get to eat @erin_ireland‘s awesome b-bread! @Dilaralit: I want in on some of your banana bread action too pls! @GoodLifeVan: Banana Bread was given to miss this a.m. by @erin_ireland – I planned on eating it over 2 days, NOT 2 minutes! Delish! @GoodLifeVan It didn’t last long enough for a picture! RT @chengsophia: Omg, @erin_ireland‘s banana bread sounds like it would taste so amazing! @GoodLifeVan: @erin_ireland I just want a piece of banana bread – just a bite. Please. @masalapuri Damn girl! The melting white/milk chocolate on top of ur #BananaBread looks delish – You should courier some to us! @Elim_Chu @erin_ireland I would eat….3 pc max. Is that too greedy? @Sliceof Luch @erin_ireland This banana bread sounds epic. And I know my banana bread. Me thinks a loaf, purely for judgmental purposes, is in order. @erin_ireland I am so ready. Do I have to suit up? Because I am prepared to treat this baby with the respect it deserves. @Summer_Dhillon: Could you send me a piece of banana bread through @goodlifevan? @Sanazj I’ve heard so much about your magical banana bread and love to try it! @HauteOnMyHeels: Same! RT @brittanyyu @erin_ireland You’re killing me with the banana bread posts, I have never thought of banana bread so much in my life. @Kmore: I’ve had the banana bread before, I’ll take complicated to have it again..
@BreatheCouture: Looking lovely as always ladies! Erin, do you have your famous banana bread with you? @buenonote: maybe we need to do a banana bread swap!! @sup_yo: “…and by chance do u have any banana bread with u?” RT @raincitybikes: #whistlertweetup “hey are you @Erin_Ireland ?” quote of the night! @Kinb_Kabuz: @erin_ireland nom nom nom. I’d be the banana loaf monster in your house. @IshraSharif: @erin_ireland Just realized I won’t get banana bread any longer tomorrow. Sad face. @SimoneGrewal: @erin_ireland I would like some banana bread too please. @SimoneGrewal Sure I will try tomorrow night! @John_C_Davies: oh. my. gott!!! Do they have twitsniff? They should totally invent that just for your banana bread. @vanvitamindaily: @erin_ireland Hope to get my hands on the To-Die-For banana bread soon. @cremevancouver: Or want a banana bread? RT @CountDownEvents: Why is it that I feel hungry every time I read @erin_ireland tweets! @smithlindsey: I feel like it’s just a matter of time before your Banana Bread is a trending topic. So happy I’ve tasted the magic! grumpybuttfunny: @erin_ireland Erin, why are you doing this? Your baked goods look soooo good, …keep it up gonna order some then the wife is gonna leave! designerjillian: @erin_ireland well…. Guess what all my guests got as a take home treat last night? Hint… It’s to die for! Thank you sooooo much!! jeremysball: Back to the city to enjoy a certain Ms @Erin_Ireland ‘s Banana bread. thatgirlcartier: @erin_ireland I think that’s my problem! Substituting delicious food for delicious men! That being said, I MUST try your banana bread! yasmin_a: is it a trending topic yet?! RT @kvbijou @NakedBoxerBrief makes 2 of us esp after hearing abt @erin_ireland s banana bread on twttr 4 days! rickrake: @NakedBoxerBrief Famous banana bread by @Erin_Ireland must be a Naked photo shoot deal-maker. jasperante: @erin_ireland I’m starting to think that Vancouver needs a museum to properly showcase your banana bread. Agree? cassycarter: @erin_ireland A lot. A little sad I’m not in town for when you were/are selling your bread. sandysumra: @erin_ireland I have the shakes – in desperate need of a hit. Can’t wait till Saturday! ronniemurakami: i need to get in on @erin_ireland‘s banana loaf hoopla….!! jeremysball @erin_ireland hehe. Shh. Moist, rich, decadent. So far so good. hitsingles: taste tested “to die for” banana bread from @erin_ireland as expected “its to die for”………………. so good. Got me some of @erin_ireland‘s banana bread! WOOOO! elsa_corsi: @erin_ireland just drooped off my banana bread order 5 min ago & it’s almost gone! I guess the rumors are true…it is to die for! Sunday afternoon watching survivor re-runs to get caught up before the finale tonite, and eating my banana bread … the only thing that has saved me from eating THE ENTIRE LOAF by myself was a friend unexpectedly needing a place to crash – from me and my friend to you, thank you so much for letting us share in the deliciousness … I know you hear this a lot, but please know we are all very sincere – you create something magic with your baking! I hope you have a great holiday season, and please keep me on your ‘banana bread alert’ if you ever do decide to share again with us!! marda miller: Thank you so much for the heavenly banana bread. I just shared some with my sister who had had 3 pieces because she loved it so much. It exceeds the much anticipated hype; it really is a delectable indulgence! I am so thrilled that I got to try some so thank you again for the opportunity. cameron_walker: @erin_ireland Got to try your banana bread on friday. Awesome! Hope the sales went well over the weekend. Still blown away by @erin_ireland‘s #itstodie4bananabread. If you haven’t tried it, you’re missing out on life. jenstoddart: I’m dying to get my hands on some of @erin_ireland‘s banana bread. threesixtykelly: @erin_ireland @7thCanuck Ppl keep talking about the amazing bread!How do I get in on beer,bread,hockey night? nealsimpson: @erin_ireland Erin how good can said banana bread be?! Seems like you have fans worldwide! @RonnieMurakami: I keep hearing about erin’s banana bread! RT @VancityBuzz It’s the best banana bread ever! @ShawnaJacques: I need to try this #todiefor banana bread that everyone is raving about! @dallasbphoto: I keep hearing about this legendary banana bread of yours…I smell bake-off! Bring some by CTV sometime so we can taste! Gary Ho: Can you send a banana bread? Holy smokes, you can send it frozen, and it should be good by the time it gets to me! J. Koslov: Your banana bread at Milano was unbelievable – perfectly moist with a running train of chocolate on the bottom and perfect balance of banana! Enjoyed it with my cappuccino.